Network for Business leaders: KingsArmsNet _ Mathias Vestergaard Corp.
KingsArmsNet is a new and exclusive network for twenty business leaders from Denmark. They met during a leadership training program and decided to stay in touch so they could exchange valuable insights and experiences. 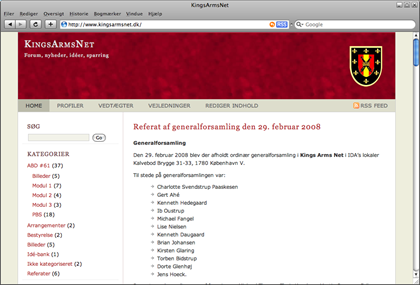 Since it is difficult to have collegues when you ate actually in charge, KingsArmsNet also functions as a social group. After the network had been formed, Charlotte Svendstrup Paaskesen came to me and asked me about how they could establish an affordable website and communications platform. Through the usage of open source software from WordPress.org and a modified design template, I was able to set up a simple site on a very low budget. Consequently, I hired an assistant to help me migrate all their existing data (photos, documents etc.). Unfortunately, the website is closed to the public.